Today we left Jacmel at 7:00 a.m. to return to the States for two weeks. Our flight from Port au Prince was scheduled to depart at 1:00 p.m. for Miami, FL; then we were to depart at 6:30 p.m. from Miami to Newark, NJ. 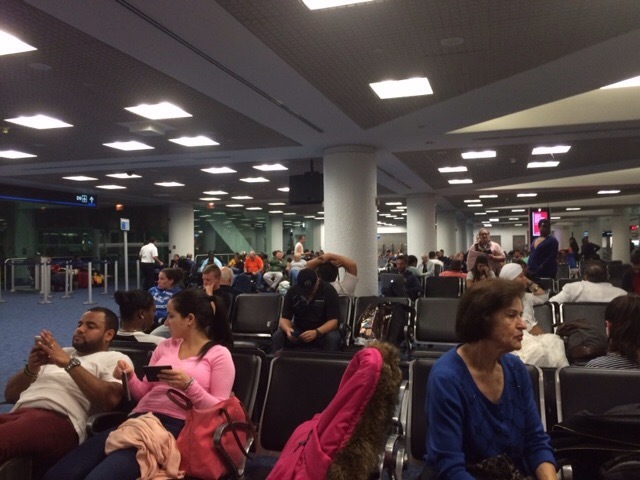 After settling some business in Port au Prince, we were by the gate at 11:00 a.m. Everything was on time. We rejoiced because the last time we left Port au Prince we had been delayed six hours, because a flock of birds had hit the engine. We already started to plan what we would get to eat at the Mexican Restaurant in the airport. We boarded the plane at 12:20 p.m., and then it was announced that there was engine problem so we had to de-board. We were delayed four hours this time, but we knew that we would not make our connecting flight again. We finally left at 4:50 p.m. and arrived in Miami at 7:00 p.m. 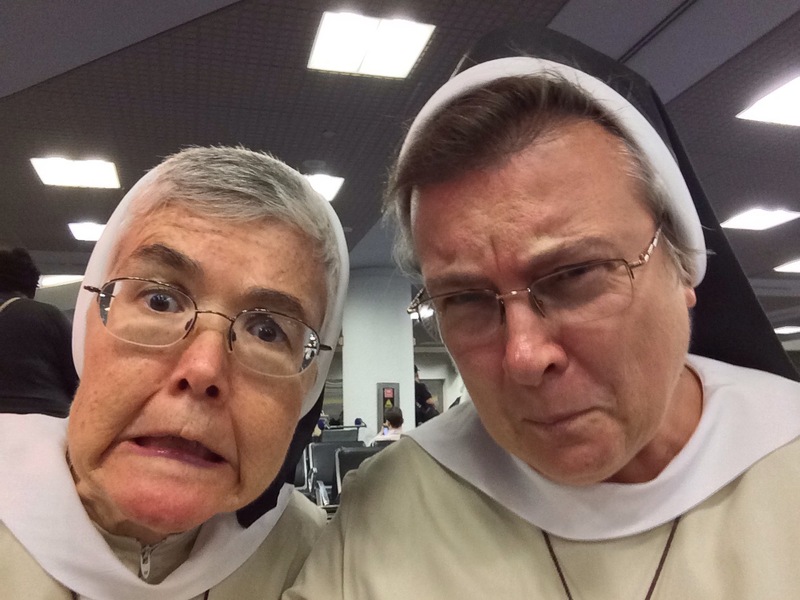 Here we go again…We need to get a flight back to NJ. 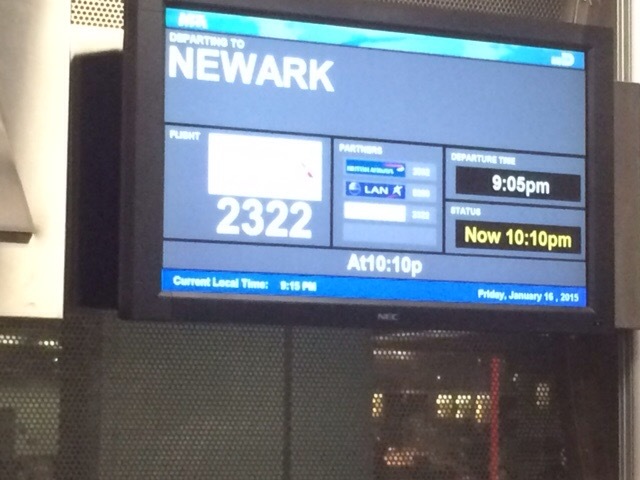 We were scheduled for the 9:00 p.m. flight to Newark. We were happy to get flight, but we did not get a voucher to get something to eat. The 9:00 p.m. flight was on time. We boarded the plane, ready to go, as we were eating some Greek yogurt. And then came an announcement. There was no flight crew. We needed to wait for a new crew that was coming from La Guardia, which meant we had to de-plane again and wait another hour. Looks like we will not get back until after 1:00 a.m. Yes it is truly unbelievable. Hopefully you will arrive safely in the wee hours of the morning. Thanks for the pictures and update. Just I piece of info. Fr Jude Duffy died yesterday. The funeral is on Tues in Beacon. LOVE the selfie…………….you both look too fierce for anyone to mess with you! How do we do it? Faith and a sense of humor which I see on your faces. Love you all. Sr. Marilyn, are you going to see Chris and Ali? I would make the trip to Portsmouth to see you, if so. All Love, Carol Pedigree, Chris’s sister and remember, last time we saw each other was at your sisters funeral where you wished me well on my trip to Avila, Spain. Your photo is hilarious. Safe travels. LOL – I understand – airports are very difficult. Any chance for a visit when you are in NJ?? ?